A lifelong resident of the Wissahickon Valley area, Susannah Hart Thomer brings life to the scenes in her paintings that only a seasoned Chestnut Hill veteran can. Growing up on our very own Graver's Lane, Hart Thomer reminisces about her family's frequent visits to Valley Green to walk and sometimes fish. specifically noting her longing as a child to go horseback riding at the stables in the area at the time. 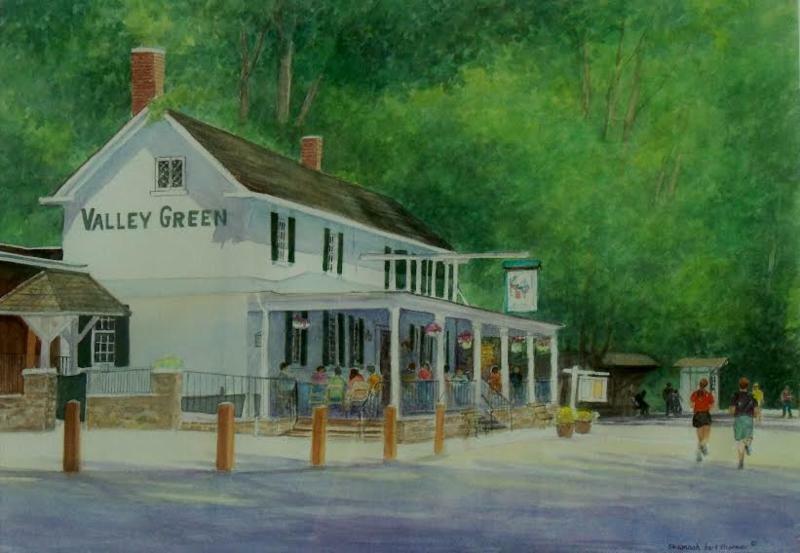 You can see the personal connection and nostalgia that resonates with so many of the residents of Chestnut Hill in the warmth of her watercolors. She's painted Valley Green many times from the Chestnut Hill side as well as from her more recent Plymouth Meeting residence. Susannah Hart Thomer has shown in Chestnut Hill Gallery for a number of years as well as throughout the city as a mural painter. Hart Thomer and her painting partner produced a large scale mural, which is installed at the new Einstein Hospital in Norristown, of a "secret spot" she discovered years ago where the Wissahickon flows over a small dam. We are delighted to debut our first month of featured artists in our new location with a selection of paintings that hits so close to home for the Chestnut Hill and surrounding area residents. Please join us in celebrating the work of Susannah Hart Thomer and our new expanded gallery on Saturday, September 10th from 6 to 8 pm! All work will be for sale, including a special on giclee prints!